Aweber changed things recently, making it confusing for people to add lists if they aren't aware of the new changes. 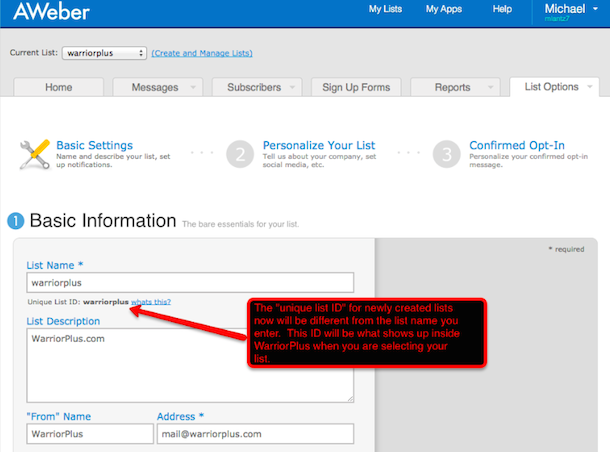 Even though you give your list your own unique name, on all NEW lists, the "unique list ID" will be something like "awlistXXXX" -- and that is what will show up inside WarriorPlus for you to select from the drop down menu within the product editor. The Unique List ID will be directly underneath the "List Name" box, as seen above.